We are proud to announce the first ever Osprey Chicks in the Regional Park. Clyde Muirshiel Regional Park Ranger Service and staff would like to celebrate the successful rearing of the first ever Osprey chicks born in the Park. 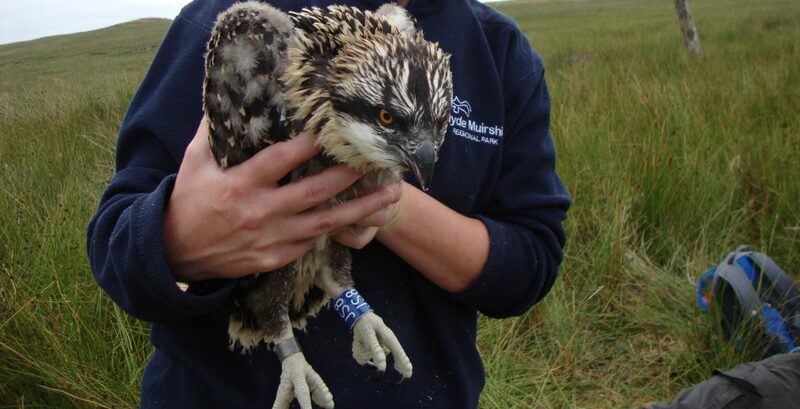 This project was started several years ago (2010) by the Ranger Service when adult Ospreys were seen fishing over local water bodies. Advice from wildlife expert Roy Dennis, enabled Osprey platforms to be sited to encourage nesting in the area. We were excited to see the Ospreys back earlier this year and nest building was observed. With the male bird supplying the female with food all indications were positive for a successful pair bonding which has produced two chicks. With the aid of the Rangers, Park’s Estate staff and the Tag-n-Track team, the chicks have been ringed with the colour rings Blue/White JS8 and JS9, so we can monitor their future distribution. The two chicks, one female (JS8) and one male (JS9), have now fledged and hopefully this is the start of many more of these spectacular birds gracing the skies over the Regional Park.